Boy, I’m having a hard time getting this review started. I’ve written about this movie three times already, but never in any detail. It would be a cop-out for me to say something like “The film speaks for itself” or “It defies explanation”. I’m just struggling to put sentences together. I guess I’ll just have to throw out some random thoughts. I have a rewatch of Stroszek in the pipeline as well, but unless my feelings have drastically changed, I like Bruno S. so much better in this film. His blank expressions and childlike innocence and odd movements suit the character so perfectly. As I said in a previous review, I can’t imagine anyone else playing this role. Well, I suppose I can imagine it, but to me, Bruno owns it. It’s such a fascinating story, and Herzog is the ideal director to bring it to life, with his talent for spotlighting characters on the extreme fringes of society. How does a person with no exposure to the outside world for his entire developmental period process everything? We learn so much as children, and he has to start practically from scratch. He doesn’t know how to walk, or react to danger, or express a thought, or put on clothes. He seems petrified, not out of fear but out of not being aware that he can make a decision. As he develops, his outlook is not shaped by the usual years of education and indoctrination. Religion and logic are equally absurd to him, they don’t fit into his skewed worldview. What really makes this movie special is its heart. 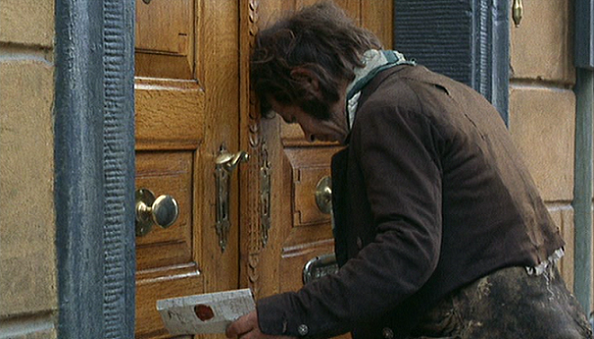 It may be Herzog’s most touching film, at least I can’t think of a more touching one off the top of my head. Bruno S.’s characterization is so beautifully gentle, as he feeds a little bird, or tries to teach a cat to walk on two legs, or plants his name in the garden, or marvels at his reflection in a barrel of water. When he holds an infant, tears streak down his face. His stitled lamentations — “Mother, I am so far away from everything” — are incredibly poignant. This entry was posted on April 6, 2013 at 7:00 pm	and is filed under Movie Reviews. You can follow any responses to this entry through the RSS 2.0 feed. You can leave a response, or trackback from your own site.